Items in your cart are not reserved for you until you've completed the checkout process and received the order confirmation email from us. For payments via bank transfer, items will be reserved for you for the next 24 hours awaiting your payment. If payment is not received within 24 hours, your order will be cancelled. If you are unable to add an item you want to your shopping cart, it means it is currently out of stock. See how you can join the waiting list below. The design I like is out of stock. How do I join the waiting list? Step 1) Select the out-of-stock size you are interested in. 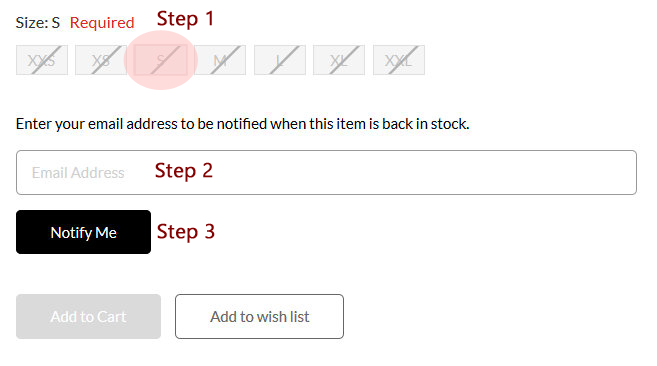 Step 2) Enter your email address in the box to be notified when the item is back in stock. Step 3) Click on "Notify Me" button. You will be notified when the size is back in stock. The back-in-stock notification does not reserve an item for you, and does not obligate you to make a purchase. Items are available on a first come first served basis, so do place your order quickly to secure the item. You can shop without creating an account. However, register an account with us and you'll be able to save your address and track your orders so you can shop more easily next time. Due to our efforts to ensure you receive your order quickly, we will not be able to accomodate any modification to your order once its status is "Awaiting Fulfilment". Kindly ensure your details are correct before confirming and making payment for your order. I've made payment for my order via PayPal. However I did not receive an order confirmation email from ALYSSANDRA. I've made payment for my order via Mastercard/VISA. However I did not receive an order confirmation email from ALYSSANDRA. Upon successful payment, you should receive an order confirmation email from ALYSSANDRA. After trying to make payment, I received an error message "Something went wrong with your order". Contact us immediately so we could help check if your payment has gone through successfully. How can I view my store credits? Log into your account and you would be able to view your available store credits. Simply check out your order as usual. During the payment stage, you will be given the option to offset your bill with your available store credits. No coupon code is required. You can then proceed to make payment for the balance amount as usual. Yes! Simply spend S$100 in a single order to qualify for our ALY Platinum membership. Find out more about the exclusive discounts here. I am a ALY Platinum member. How do I enjoy the discount? Simply log into your account to view the discounted prices you are entitled to. No coupon code is required. There will not be a separate line of discount during checkout. How do I change the viewing currency? All our prices are stated in SGD. 1) On PC: Right at the top of the webpage, select your preferred currency from the dropdown list. 2) On mobile: Go to menu > At the bottom of the drop down list, click on the link "Select Currency". Do note that the final exchange rates will be determined by your credit card company and it is not within our control. As such, the final prices you are charged may differ from the indicative prices shown. Can I request for delivery at specific timeslot? We are unable to specify the time of delivery. For Aramex courier deliveries, the delivery times are Mon-Fri: 9am to 6pm and Sat: 10am to 3pm. Kindly note that local normal mails do not have tracking number and customers will bear the risk of lost mail. Kindly opt for registered mail or courier delivery if you wish to track your order. All orders are sent via SingPost or courier. Self collection is not available. Please contact us immediately after you've placed your order for assistance. If your order has not yet been shipped, we will assist in amending your shipping address. However, if your order has already been shipped, we will be unable to change the shipping address. Mails may be returned to us if an incorrect/incomplete mailing address has been provided. In such cases, customers will bear the reshipping cost for us to resend the package to you. For international customers outside of Singapore, please be aware that import duties, taxes and charges in the destination country are not included in the item price or shipping charges. These charges are the customers' responsibility. Customs policies vary from country to country and we have no control over these charges. Please contact your local customs office for further information before you order, so you are not surprised by charges you were not expecting. You can refer to our size guide or contact us for assistance. Yes! Please refer to our exchange & return policy here. Do you have a physical shop where I can try on the clothes? We are an online-only boutique and do not have a physical shop. I'm in between sizes. What size would you recommend? Most of the apparel are not highly stretchable, hence we recommend you take the larger size if you are in between sizes. Do contact us for further assistance. Yes we do! You can place your order here. The gift card will be valid for 1 year from the date of purchase and it has to be utilised within this timeframe. How can I check the remaining balance of my Gift Card? Gift cards cannot be returned or exchanged for cash. All returned items that were paid for with a gift card will be refunded as store credit to your account for you to use against a future order. Backorders are opened for popular sold out designs, so you could get a second chance to own the piece you have been eyeing. Orders are placed with the factory to re-manufacture the items and stocks typically take 7-8 weeks to arrive from the time the backorder opens. It’s as easy as purchasing an instock item! Create a new order. Place a separate order for backorders and instock items as they will be shipped separately. If you put in an order consisting of backorders and instock items, your combined order will only be dispatched when the backorder has arrived. The arrival of backorders is dependent on the manufacturing process and shipping, typically taking 7-8 weeks. Backorders are subjected to unforeseen delays and cancellations. As we are unable to confirm the exact arrival dates, please only join backorders if you are comfortable with the long wait. In the event we are unable to fulfill your backorder, we will notify you as soon as possible and provide you with a full refund. Alyssandra reserves all rights to cancel backorders and change the terms & conditions any time. Separately hand wash all apparel in cold, running water. Do not soak the apparel, as colour transfer may occur. Strong detergents e.g. Dynamo should be avoided. We also recommend you steam iron where possible. Otherwise, press iron on reverse side of apparel with low heat. This is to help maintain the shape of the apparel during packing. To open up the pockets, you can use a pair of small sharp scissors to cut open the stitches carefully.